Zoho has always believed that our customers should have access to the best technologies around. This belief led us to integrate with Google, and we haven’t looked back since. Six years later, we stand as a G Suite Premier Technology Partner, and a leading software provider in the G Suite Marketplace. 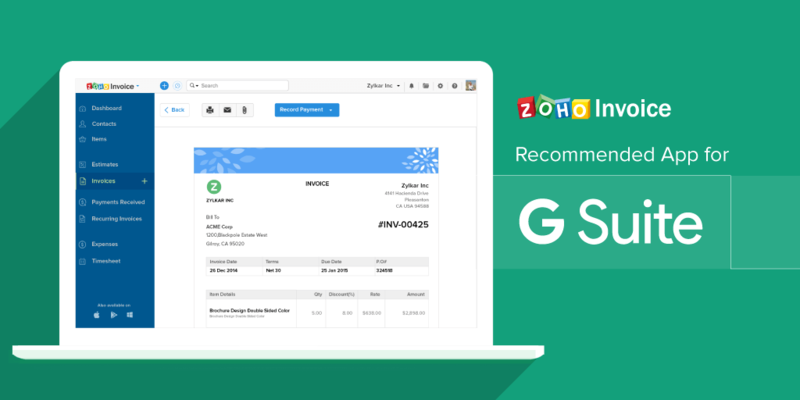 Today, we are excited to announce that Zoho Invoice has been chosen to join Google’s Recommended for G Suite program. Google now recommends Zoho Invoice as a safe, reliable, compatible invoicing software to their customers looking for an invoicing app that works well with their existing productivity tools. Single Sign On: Use Single Sign On to access all your transactions stored in Zoho Invoice from within G Suite, without having to remember multiple passwords. Import Contacts and Users from G Suite: Easily import contacts and users from G Suite to Zoho Invoice. Forget minutes, you will save yourself hours of manual work. Save Files with Google Drive: We understand how important it is for you to have everything you need in one place. Save your documents directly to Google Drive and access them from anywhere. View Emails in Zoho Invoice: Access your emails from Gmail within Zoho Invoice, and keep track of your conversations with customers. The Android Platform: To top it all off, enjoy smart invoicing on the go when you access Zoho Invoice and G Suite on your phone. Run your business like a boss from wherever you are. It’s going to be an early Christmas here at Zoho. Come and join the party.